Folk songs and music of a community, uninfluenced by any sophisticated musical rules or any standard Music styles. Bangladesh has a rich folk music, which includes both religious and secular songs. The history of folk music composition can be traced back to 8th century between (1800-1850) A.D; which was the time for growth of Charya Geeti. Generations of rural poets; composers created enormous tradition of Bangla folk music. Of which “Baul Song” is the most remarkable. The folk song of Bangladesh is a mixture of Vaishnaism and Sufism. It also may be classified as being an emotional, secular, sectarian and religious song. i. It is composed by rural folk on basis of ancient rules transmitted orally. ii. These ancient rules of music have not been influence by classical or modern music. iii. This song may be sung in groups or individually. iv. No regular practice is required for folk music. v. It is composed and performed by illiterate or semi-illiterate people. vi. It is a spontaneous expression in easy language, local dialect, and simple tune. Both words and tune are appealing. Despite its universal appeal it uses local dialect. ix. It depends upon nature and the rural environment. x. It is an explicit manifestation of the joys and sorrows of daily life. xi. It uses simple and natural rhythms. It contains a strong emotive expression of human love and separation. In Bangladesh folk music has great variety, with songs being composed on the culture, festivals, views of life, natural beauty, rivers and reverie life. These songs are also about social inequality and poverty, about the material world and the supernatural. Mystical songs have been composed using the metaphors of rivers and boats. We can classify this mainly two ways. 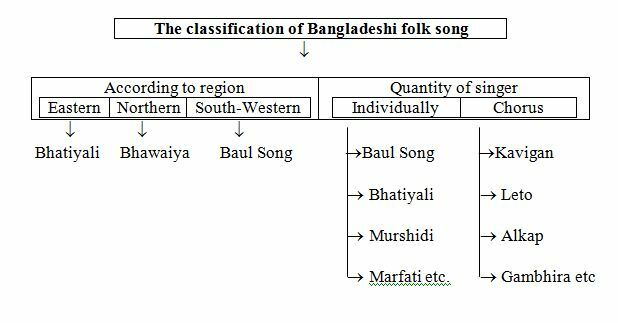 Bangladeshi folk music therefore varies from region to region. . Some songs are regional in character, but others are common to both Bangladesh and west Bengal Also Folk songs may be sung individually or in chorus. i. Bhatiyali: These types of songs are generally sung by boatman. It is seen nearly all regions of Bangladesh, basically the riverside area. ii. Bhawaiya: Actually this kind of sung by the Coachman .Specially Rajshahi, Dinajpur, Rangpur, and Pabna. iii. Baul and spiritual songs: It sung in Birbhum and Kushtia. iv. Jarigan: Jarigan sung as like as Charya by groups. It sung in Dhaka, Mymensingh, Sylhet, and Faridpur. v. Sari: In Sylhet and Mymensingh a group of singer sings this song with a particular theme. vi. Gambhira: In Rajshahi, Malda there is a special kind of song called Gambhira. It is sung by a grand-father and a grand-son about a specific topic. Murshidi: It’s a religious song. Roof-beating songs: This song sung at the northern regions of Bangladesh. ix. Wedding sings: Basically in rural areas wedding songs are sung in weddings. x. Nil Puja: To celebrate the Puja in Bangladesh this type of songs are sung. xi. Pastoral songs: It’s a one kind of regional song, sung by the tribes. Specially In Mymensingh, Sylhet, Habiganj. The folk music of Bangladesh is different from other music not only because of its distinctive mode but also because of the richness of its seventh note. Apart from its tunes, Bangla folk music is also distinct in its rhythm. 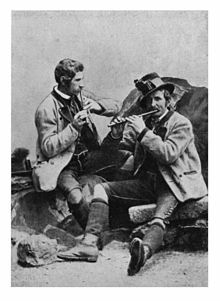 Folk music has a basic style of composition and can be classified into four groups. First, tunes consisting of: ‘Sa Ra Ma Pa’. Folk music strictly follows this pattern, which is followed only in classical music. All folk songs in the world usually involve the pentatonic scale, which is found in Bangla folk songs as well as in Santal and Garo-Hajang songs. Now a day’s western instrument such as Guitar, Drums, Saxophone and Synthesizer etc are being used along side country instrument. At present the condition of folk song in our country is very poor. Now a day our rich traditional folk song inevitable influenced by western music and culture. Band and pop music is getting popular in country. Now the modern Bangla song and also the folk song sung in western melody. TV has become the major source of entertainment. Bad kind of remixes and music videos are shown at the TV. Because of that we forget and neglect our rich traditional folk song. 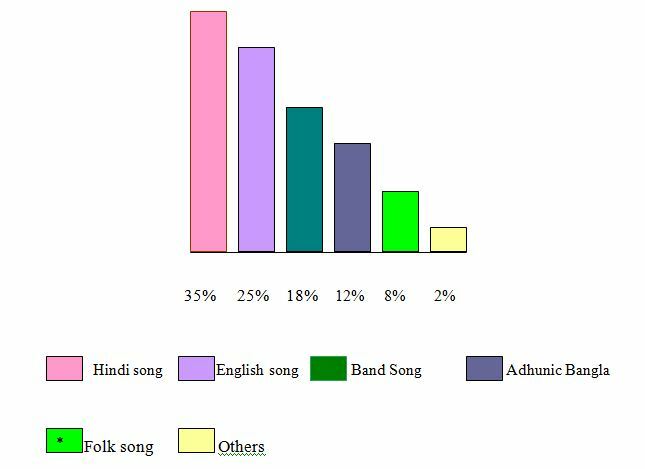 Now we like to present the condition of our folk song in our country in a graph. Bangla Band and many other unknown bauls. Government and Non- Government organization like—-Bangla Academy, Nazrul institution, Bangladesh Shilpakala Academy, Fine Arts institution, Chayanat, etc. play significant role to flourish Bangla folk song. Much popular person, singers, artists and other organization providing encouragement and popularizing Bangladeshi folk song. i We have to do a lot of concert of folk music. ii. Creating consciousness to our young generation that our own song is the best. iii. Government has to increase its attempts for folk music. iv. The number of the sponsor should be increased. v. Create a permanent academy for folk music. vi. Increase interest of music companies. vii. Ensure the financial stability of the folk singers. viii. Honored them with judgment. ix. Give them chances to perform not only in the country but also out side the country. x. Identify new folk singer and patronize them. xi. More program in TV channels. xii. Protecting the real lyrics and tunes. xiv. Some specific kind of folk song that is not available now should be protected. If we can do these activities we are over sure that, we can bring our golden musical era again.